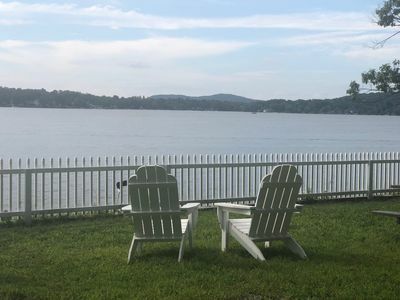 Lake Waramaug is situated in Litchfield County, Connecticut with rolling hills and farms that replicate similar scenes of Vermont or New Hampshire yet is only 2 hours from New York, 1.2 hours from Stamford or Greenwich and 1 hour from Hartford. 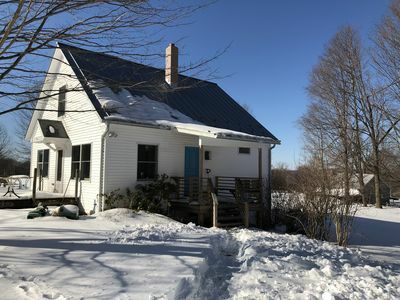 There are two large homes plus a cottage on 25 lakefront acres of beautifully landscaped and wooded property perfectly suitable for family reunions and other large gatherings and enough room to accommodate up to 40 guests. The main house, the former "Boulders Inn", was built in 1895 and entirely rebuilt and updated in 2015. 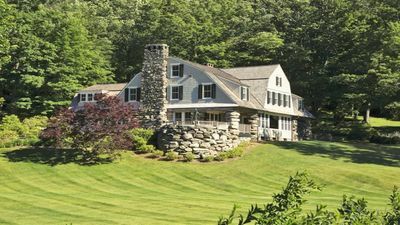 The home exudes an elegance and historic charm only found in New England. This 11,000 square foot, 9-bedroom, 7.5 bath stone (large boulders) and shingle home is situated on an expansive, beautifully landscaped property. 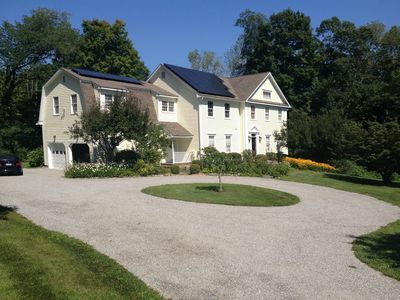 100 yards away is The "Carriage House" with 7 bedroom and 7.5 baths. In addition, there is a cottage with two separate bedroom suites. In total, the property can comfortably accommodate family reunions and guests at local celebrations. 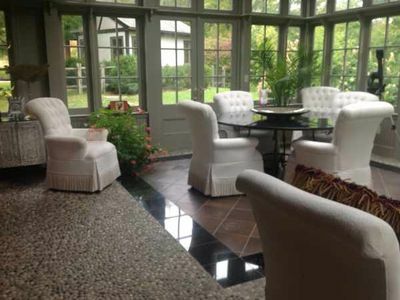 Whether you’re looking to escape the hustle and bustle of New York City or the crowds in the Hampton's, “The Boulders” estate offers everything you need to feel as relaxed as possible! 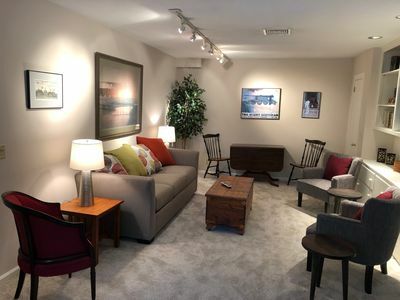 The Boulders has 14 rooms and is impeccably decorated with tasteful furnishings, gorgeous hardwood floors, and multiple charming fireplaces, making the 11,000-square foot home feel very warm and inviting. With wireless internet access and cable TV, phones and TVs in every room and a gas grill on the spacious outdoor patio, this house comes with all the essential conveniences of home. You and your family and friends will find plenty of space to spread out and relax in privacy, as the spacious layout features multiple living spaces, a library, office, laundry, and media rooms, several large patios, as well as sleeping arrangements for 18 guests. 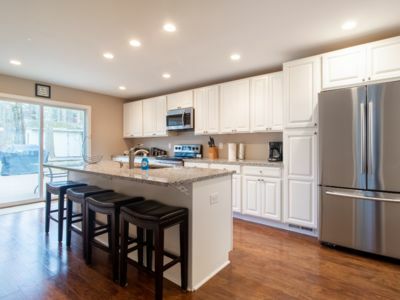 After an unforgettable day on the lake, refuel with a meal prepared in the gourmet country kitchen, fully equipped with marble countertops and stainless steel appliances. Later, sip a nice glass of wine out on the screened porch or patio while you admire the breathtaking landscape, lake views, and sunsets. One of the great features of this home is its incredible outdoor space. 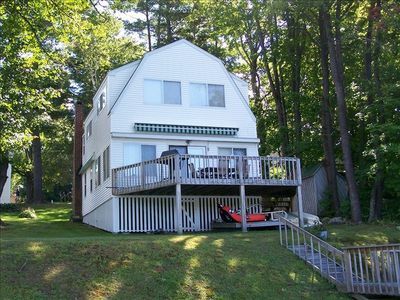 You’ll be mere steps from Lake Waramaug, where you can swim, kayak and fish, or simply relax on 500 feet of stunning waterfront. 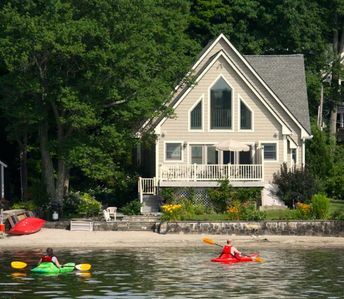 Plus, you’ll have access to a boathouse/game room and 2 docks. For moments when you’d prefer land-based activities, enjoy hiking along wooded trails that begin directly behind the home, or bike 7-8 miles around the lake. 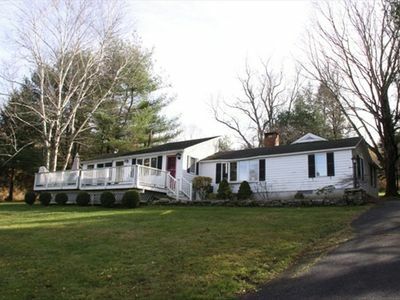 The kids will certainly love running around and playing on the large 2-acre yard. When you’re not relishing in the home’s amazing amenities, you won’t have to venture far to experience the area’s best attractions!. 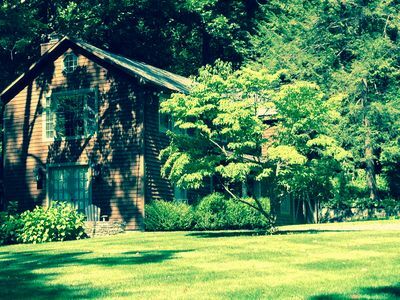 From here, you’ll be only 25 minutes from fly fishing, skiing, and several golf courses. If you’re in the mood for some retail therapy, browse local antique shops before stopping for lunch at one of the area’s quaint delis and restaurants. 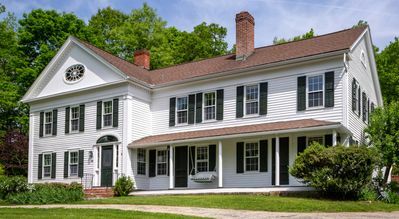 Explore the area further by sightseeing in the nearby towns of New Preston, Washington, Washington Depot, Kent and Litchfield. 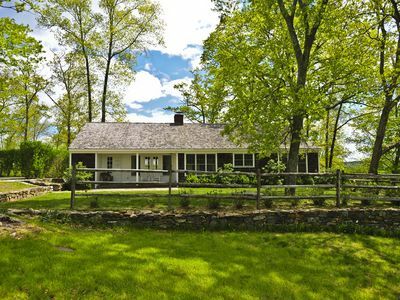 The property is conveniently located within 1 hour of Stamford or Hartford, 2 hours from New York City, and 2.5 hours from Boston. 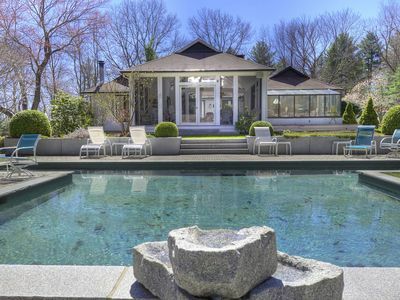 Whether you’re traveling to Connecticut for a special event or simply looking for a peaceful lakeside getaway with loved ones or friends, this extraordinary Warren/Washington vacation estate leaves nothing to be desired! 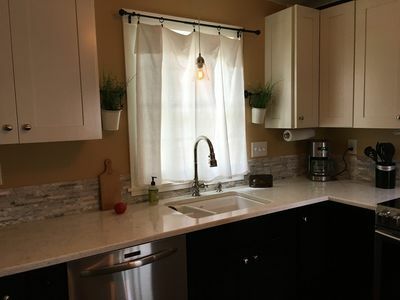 Amenities include a fully equipped kitchen complete with 2 dishwashers, Wolf oven and grill, multiple fireplaces, 6 flat screen TVs, wireless internet access, in-unit laundry machines, kayaks, canoes, bicycles and much more. 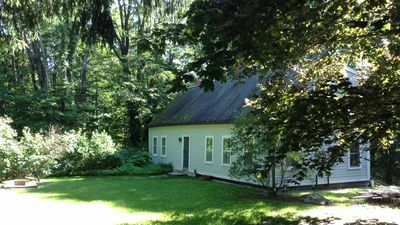 The Boulders is situated 100 yards from the “Carriage House”, a second vacation home on the property. 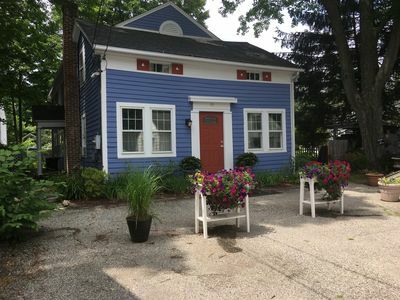 The homes can be rented together or separately for smaller groups. Catering, a breakfast chef, extra cleaning and babysitting can be arranged for an additional charge. 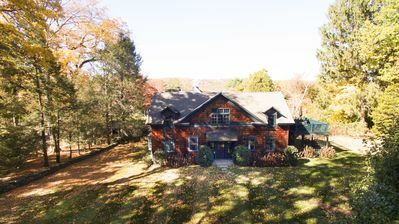 The Carriage House has 7 other bedrooms, each with its own bath and several have fireplaces. In addition, there is a cottage with two separate bedroom suites each with its own full bath. 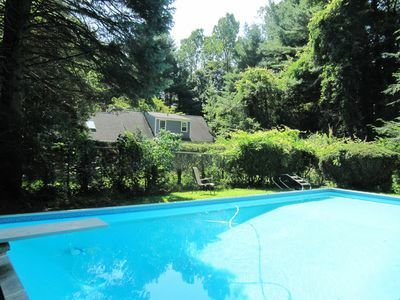 Private home, 20x40 in ground pool, grill, deck with screen house, pool house.